Ridley Scott makes another epic — this time, streamlined in the middle of the conflicting religious beliefs of the Christians and the Muslims. A fiction inspired by historical accounts, “Kingdom of Heaven” renders a cinematic vision of the Crusades of the 12th Century. Balian (Orlando Bloom), the young, grieving blacksmith from a small village in France, finally yields to the invitation of his estranged father, Baron Godfrey of Ibelin (Liam Neeson), to go to the Holy Land of Jerusalem. With the hope of relieving his and his dead wife’s sins, he finally convinces himself to lead the way towards salvation there so that his wife may go to heaven after committing suicide. As his father’s heir, Balian rises to protect his people from the Muslim invaders. From a blacksmith on a soul-searching journey, he becomes the defender of Jerusalem — carrying with him his father’s guiding legacy and ideals of promoting peace and getting hold of the kingdom of heaven. This motion picture starts with vast coldness. 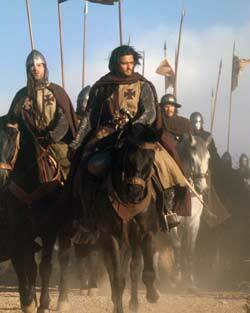 But as Balian reaches Jerusalem, lives a new life as a knight, and becomes the dedicated leader of his people, the film’s richness in color and texture starts complementing the film’s change in mood, the exposition of the characters, and the progress of the story. Scott’s directorial treatment often features playful shots utilized in effective places. He primarily combines panoramic and close-ups shots, jarring camera movements, blades and arrows flying in mid air and meeting blood or snow, and smoke effects in this religious epic fare. Though situated in an epoch of staged battles and slow-motion movements, the storytelling doesn’t turn out as remote and distant as the exotic locales the story depicts. Characterizations are given some emotional investment through tight shots. The confrontation scenes allow the audience to get nearer the characters and see their reactions through effective close-ups. The intimacy on the shots gets further amplified with the fight scenes seizing moments for each dying man. The overall visual treatment promotes not just the opportunity for sheer grandeur and lush cinematography for a period epic, it also opens up the storytelling to the more human side of the tale. The many lingering shots help the audience digest the emotions involved in the scenes. The musical score seems pegged from its epic film counterparts such as “Alexander,” “Troy,” and even “Lord of the Rings” (“LOTR”). But its distinct combination of Christian- and Muslim-inspired tunes renders good timing and personality to the material, which is in par with the story’s visual and emotional requirements. This also gives its space of separation from its epic pegs. The orchestral soundtrack particularly puts atmospheric grandeur to the many battle scenes. “Sometimes, you should choose to do the lesser evil to do the greater good.” This is the idea behind a striking dialogue between Sibylla (Eva Green) and Balian during a time of crucial decision-making — whether he marries her or not — after he kills her wicked and arrogant husband Guy de Lusignan (Marton Csokas) who happens to be the heir to the throne after the leprosy-stricken King Baldwin (Edward Norton) dies. The idea of doing one evil for the sake of the greater good opens up some conflicting ideas to rattle the minds of the audience, especially in a Christian world were murder is absolutely a sin. The relationship between Balian and Sybilla is one of the movie’s weaker points. It gets developed in an uneven manner. It is as if it starts out as a given aspect in the main storyline, but during the latter part of the story, the issue becomes precariously injected without concern by putting cutaway shots of Sybilla in between the battle scenes without any useful sway. He may be wearing a mask the entire time, but Edward Norton shines in his sensitive portrayal of the leprosy-stricken King of Jerusalem. Neeson, Green, and other supporting cast members render fine acting performances. However, for the main actor Bloom, his portrayal turns out mostly two-dimensional, and as if he has not left his Legolas role in “LOTR.” His performance lacks dramatic breadth. More often than not, he tends to recite his dialogue like in an acting class — while practicing for a monologue. The story never loses its focus. It clearly concentrates on Balian, and Scott never completely fails the audience with his main character, even though Bloom is not able to deliver very well on the acting department. It’s quite a disappointment though that Sybilla gets forced with such a presence by the latter part of the picture, as if she is a useless or an unfitting garnishing on a delectable plate. The issue between the conflicting religious beliefs of the Christians and the Muslims, which are carefully presented in the story with respect and in good faith, make their own marks in the story. Even if this tale is set centuries ago, modern viewers can easily relate to it. Amidst its flaws, “Kingdom of Heaven” remains as an entertaining mainstream offering with its grand cinematography, production design, and sound design. Its confrontational parts, intimate moments, and battle scenes are directed with engaging style. This motion picture runs nearly 2.5 hours, but the pacing doesn’t drag. Those who prefer consuming cinematic luxury on screen should find this film most enjoyable.